Time to get up close and personal with some veggies from our farm today. And some wildlife, by chance. These are Anaheim Peppers. They are mild and delicious. 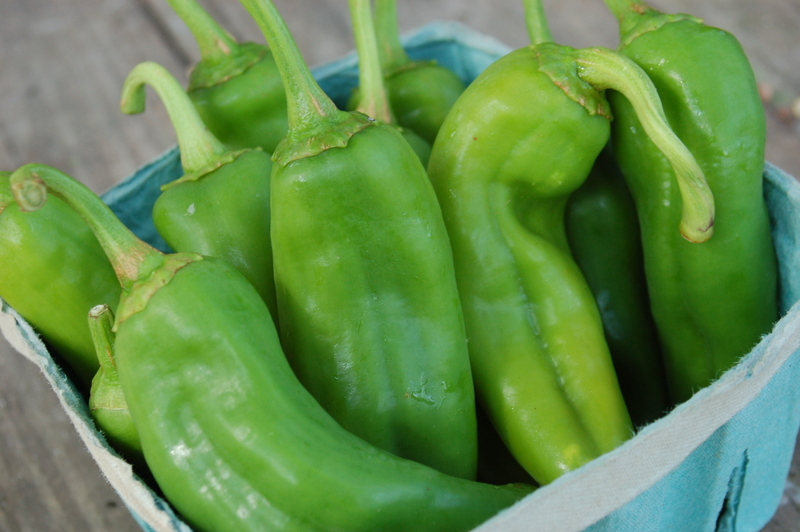 They are our go-to peppers for dicing into salsa and for grilling. They add a wonderful crunch to salsa, and grilled they are delicious on their own or as a topping for a wrap, sandwich, or salad. 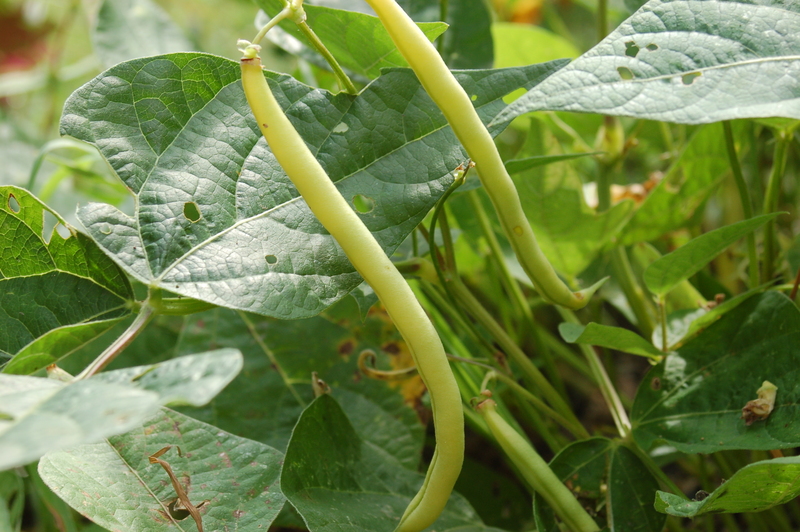 These are our favorite variety of Green Beans (though they are yellow). 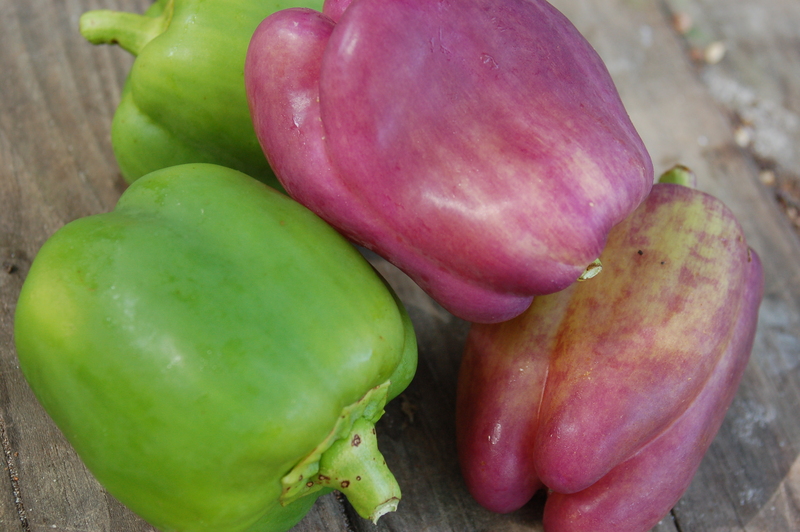 They simply taste even better than the traditional green ones, in our opinion, so we grow both. We never cook green/yellow beans, but love them tossed with soy sauce, sesame oil, honey, garlic, ginger, apple cider vinegar, and sesame seeds. Oh my, it’s good. Enter farm wildlife. 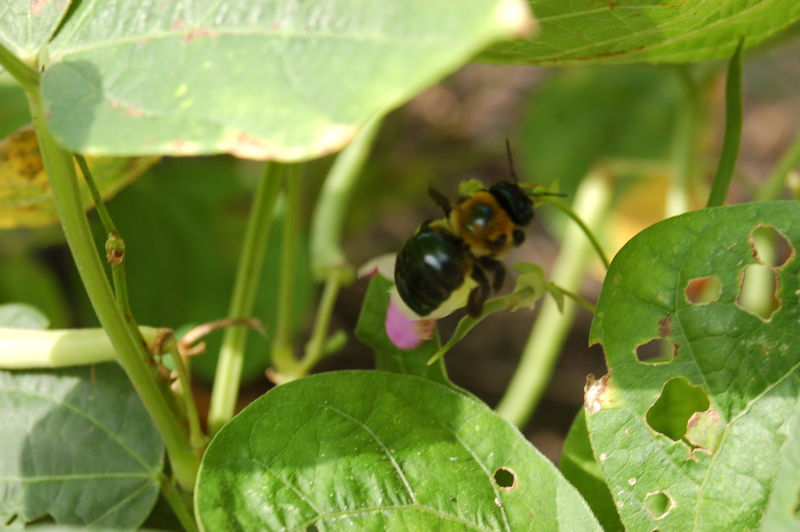 The beans rely on pollinators like this. 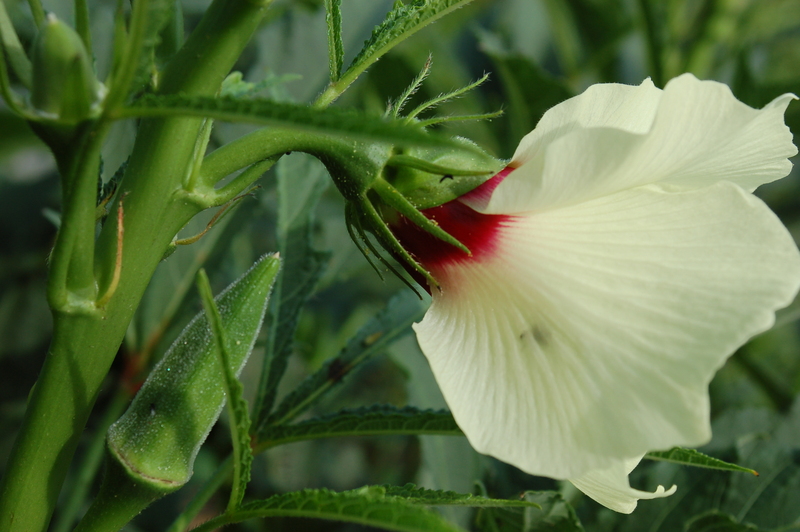 Okra pod and Okra flower – the most beautiful and delicious things on our farm, in Janet’s opinion. Roast them, pickle them, fry them, grill them. Check out this list: They are a good source of Protein, Riboflavin, Niacin, Iron, Zinc and Copper, and a very good source of Dietary Fiber, Vitamin A, Vitamin C, Vitamin K, Thiamin, Vitamin B6, Folate, Calcium, Magnesium, Phosphorus, Potassium and Manganese. Whew! 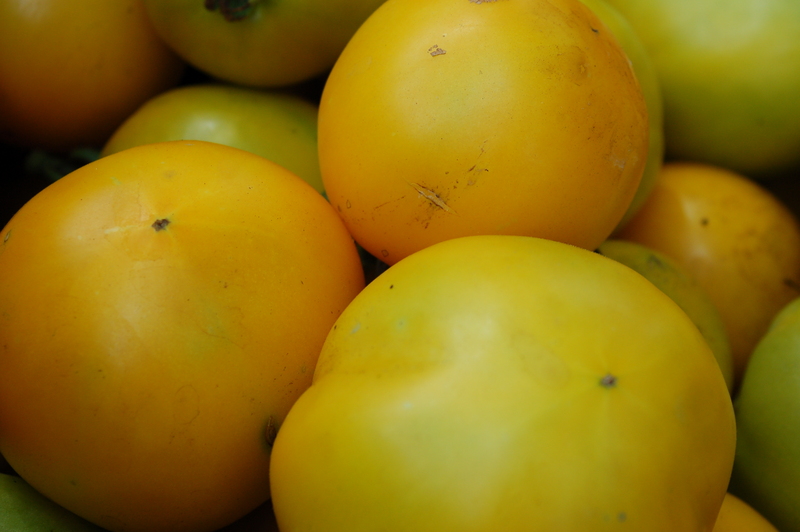 Yellow tomatoes are the tastiest, in our opinion. We eat them for breakfast around here. You know what’s coming…They are a good source of Dietary Fiber, Thiamin, Riboflavin, Vitamin B6, Iron, Magnesium and Phosphorus, and a very good source of Vitamin C, Niacin, Folate, Potassium, Copper and Manganese. Skip your vitamin capsules and eat lots of these things! We especially love them sliced on a piece of (our) bread, with maybe a touch of cream cheese and sea salt. One last introduction: Our onions. 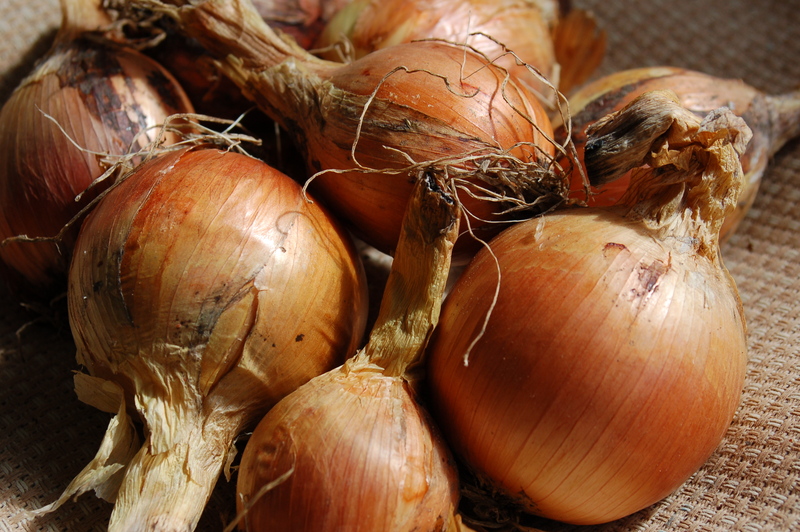 This rainy year made pulling and curing dry onions tougher. We’re selling first the ones that don’t seem to be as likely to store. So, buy these and use them. After these are gone, we’ll dip into the more properly cured ones that will hopefully store into the fall. Maybe winter? Onions are a very good source of Vitamin K.
Not wildlife above, but an (admittedly terrible) photo of our crew thus far this summer. Two of these lovelies, Nick and Kathleen (blue shorts and purple shirt), have now ended their time with us. 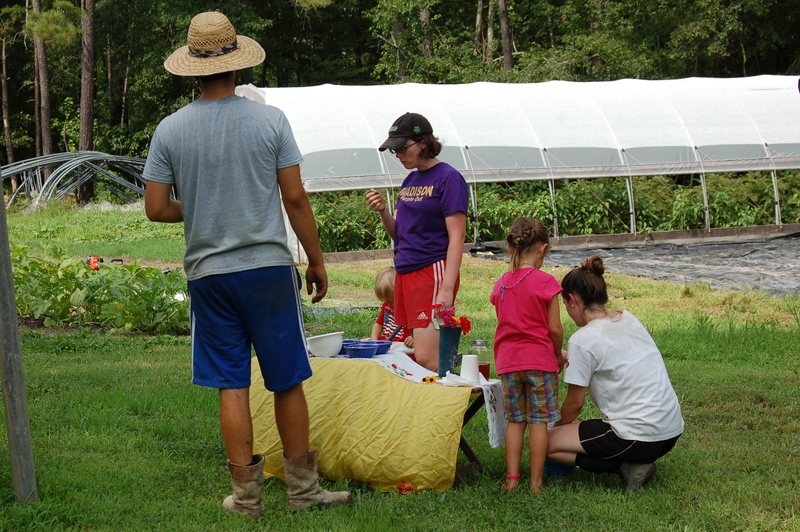 We thank them for their work, their spirit, and their passion for local, organic food. We will miss them and wish them the best on their future pursuits. The third, Gabby (white shirt), is thankfully continuing to tend your food here. Thanks, Gabby! 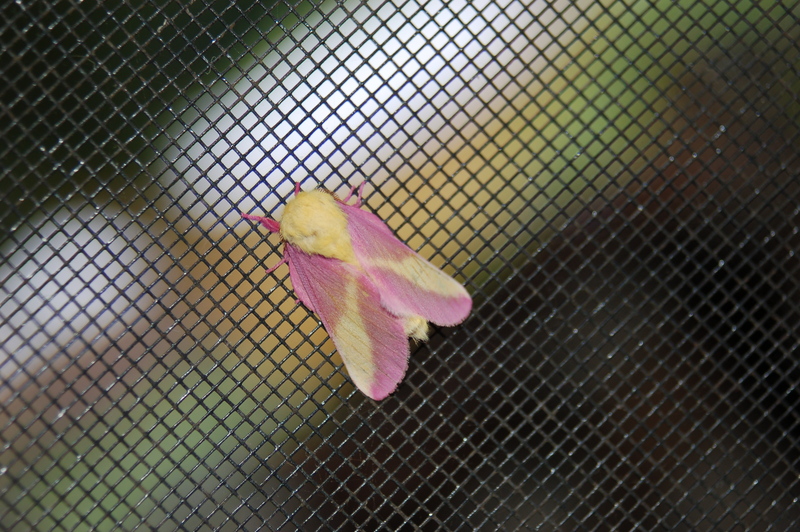 Farm wildlife #2: The Rosy Maple Moth paid us a visit this week! Eggplant (three varieties), Garlic, Green Beans, Lettuce, Microgreens, Okra, Onions! (white), Peppers (Sweet Banana, Bell, Padrone, Hungarian Wax, Anaheim, & Jalapeno), Potatoes (red and yukon gold), Summer Squash (Yellow, Green, or White), Tomatoes (green, yellow, or red)…and Multigrain Bread and Pepper Jelly. Suggested Recipes – Stuffed Eggplant, Curry Roasted Okra, Coconut Curry Eggplant, Peach Vinaigrette for your Salad….all found on our Recipes page.